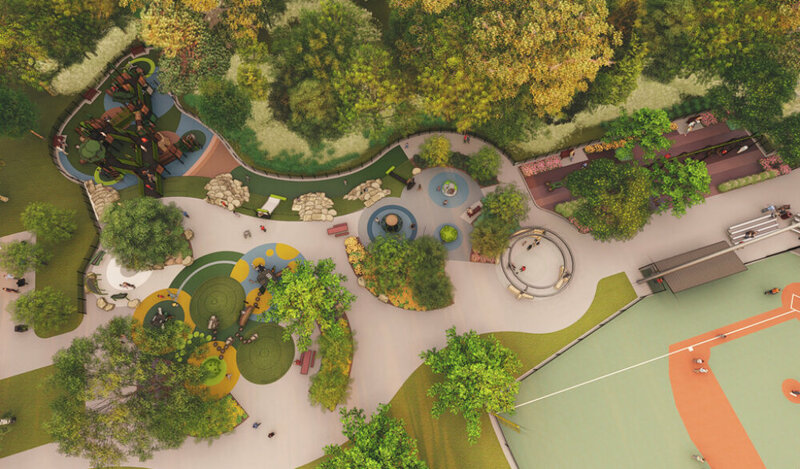 An aerial rendering of the playground and plaza. Incorporating equipment geared toward different levels of development and ability creates a welcoming experience for all users. 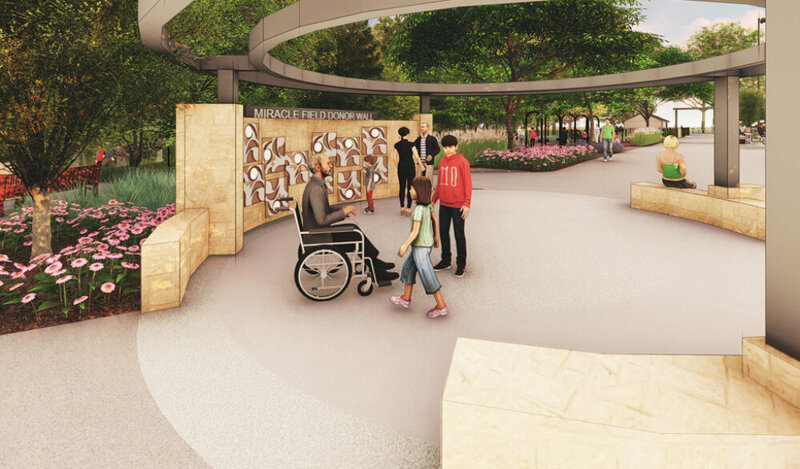 A rendering of the sensory donor plaza, which will feature seating and interactive play components. A rendering of the all-inclusive jungle gym. At-grade playground equipment is accessible for users with diverse mobility needs, while promoting all-inclusive play. 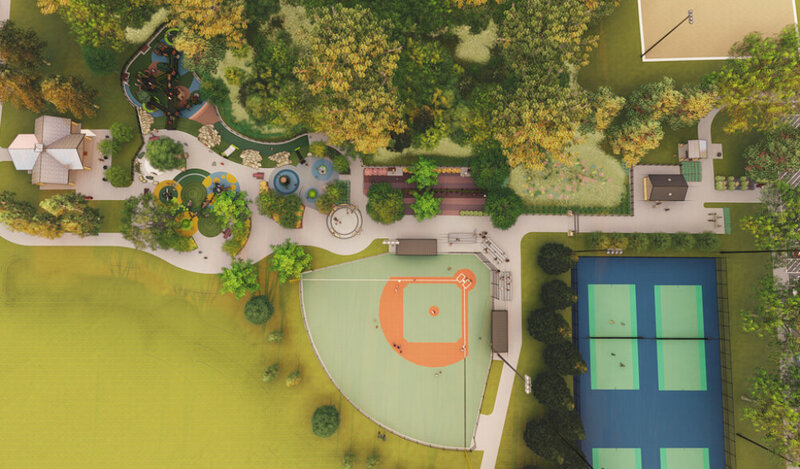 An aerial rendering of the entire park featuring a new, all-inclusive playground, Miracle League Field, and more. Facilitating a community vision that encourages inclusive play and social equity. Developing a plan with strategies and tactics for addressing community concerns and site challenges. Creating a unique and valued vision that encourages donations and community investment. The project was led, managed, and supported by a diverse Snyder & Associates’ team comprised of landscape architects, engineers, and surveyors. As the prime project consultant, we championed all plan components and served as the direct contact to the client and Miracle League Committee. A site inventory and analysis of existing park uses, natural features, and circulation was completed to help guide creation of the master plan. Stormwater Management – Stormwater will be captured and treated on-site using a series of stormwater basins. Traffic & Parking – Other than the addition of five accessible stalls marked to accommodate Miracle League activities. Existing parking areas are expected to meet user needs. Noise – Audio equipment will be used in a limited capacity and is primarily for the Miracle League Field game use to show support for athletes. Sound will be directed toward viewers and away from neighboring residents to mitigate noise concerns. 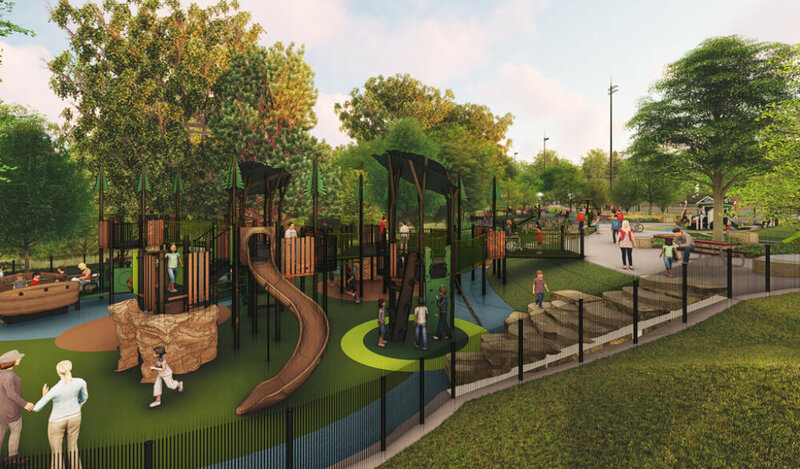 Visual – Strategic tree plantings will complement and extend the nearby natural, wooded environment into the play area, provide a visual buffer from neighboring properties, and increase shade within frequently used areas. Safety – A fence along the ravine will help support safe play and recreation for all users. Lighting – A controlled LED lighting system reduces glare and provides a bright, uniform light source directed onto the field. Use of controlled lighting will also protect from light pollution in the sky and onto neighboring properties. Light placement is based on the need to light the field evenly and ensure the ball in play is lit from all sides. Learn more about all-inclusive play & Miracle League facilities. Seizing the opportunity that arises with project challenges, we were able to make steep topography of the site work to benefit the project. Several trees along the immediate tree line were identified as damaged and in need of removal. As a result, the opportunity arose to move the playground further north, tucking it into a small opening amongst the trees and maximizing the use of available space. The play area was also strategically laid out with several unique nodes based on development levels with a variety of sensory components. 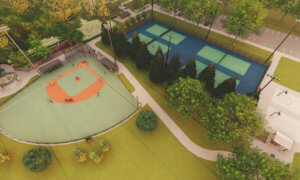 An aerial rendering of the new Miracle League baseball field with tennis courts located nearby. 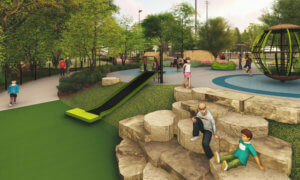 Utilizing the existing topography of Inis Grove Park for slides and climbing features. Ramps and slides utilizing the existing topography along with rubberized surfaces help support safe, all-inclusive play and access for individuals with mobility challenges. Accessible trail routes throughout the park connect amenities with the neighborhood and regional trail network. 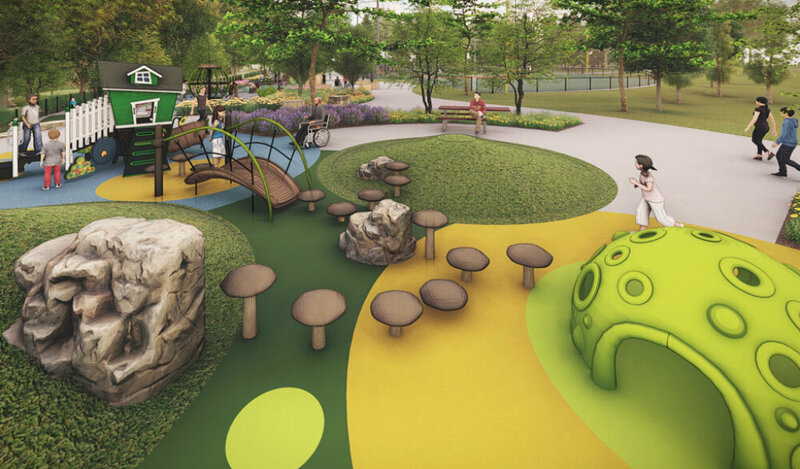 The playground will have a nature theme with a natural color scheme to mimic the park’s natural surroundings. Different styles of playground equipment offer varying levels of challenge for different ages and levels of development. Slated for completion in summer 2018, the project strives to provide a sensory rich, developmentally appropriate and unique experience for all users regardless of intellectual, sensory, or mobile capacity. With a strong dedication to promoting and expanding all-inclusive play opportunities, Snyder & Associates has also contributed to the successful development and implementation of Miracle League Fields in Ankeny and Urbandale.